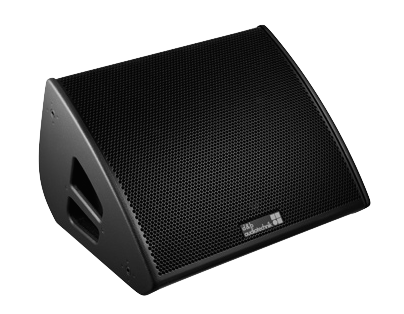 The M2 is a 2-way high performance stage monitor, with a peak sound pressure level of 143 dB. Its design uses a low height cabinet, achieves a constant directivity of 45° x 60° > 600 Hz and significantly raises the feedback stability margin. Together with the cabinets baffle angle of 40° (to floor), the dispersion performance offers a realistic artist listening area starting directly above the cabinet and reaching quite far upstage. The result is a loudspeaker system with remarkable vocal presence, clarity and neutral, balanced sound. The M2 cabinet is constructed from marine plywood, incorporates handles and has an impact resistant paint finish. Two fittings, which accept ball-lock shackle pins, are located on each side of the cabinet allowing quick and flexible rigging. 16.5 x 26.8 x 22.1"